SHAH ALAM: I-Bhd's serviced residence project known as i-Residence, has sold almost 65 per cent of the units available even before it was launched yesterday. I-Residence is the third component in the i-City development. 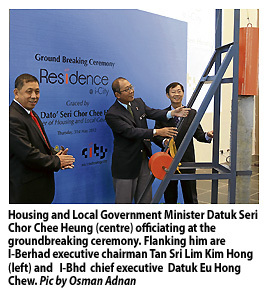 I-Bhd chief executive Datuk Eu Hong Chew said the company has managed to entice the hip and happening crowd of young families and singles to invest in i-City as their first property. "Most of our buyers are first time buyers, newlyweds aged below 35 years old," he said after the launch of the i-Residence project. Also present at the event was Housing and Local Government Minister Datuk Seri Chor Chee Heung who said that the had welcomed, the developers many initiatives to make it a safe city to live in. Eu said the new residential area would take at least two and a half years to complete with a gross domestic value of RM225 million. "We hope that more and more people will invest in our properties in due time. The whole area will be developed within the next 10 years. Right now only 15 per cent of the land has been utilised," he said. I-Residence, a 33-storey condominium comprises of 346 units in two tower blocks and 20 units of low density exclusive duplex villas. The duplex villas are ideal for large families with a built-up area ranging from 2,400 sq ft to 3,700 sq ft and offers 3+1 or 4+1 bedroom with private lift and a 50m Olympic sized long swimming pool at the doorstep. I -City is a RM5 billion ICT-based integrated township development consisting of a shopping mall, cyber office suites, corporate towers, hotel along with residential and retail components. The 72-acre freehold site, with 13 million sq ft of built-up, has been endorsed as a MSC Malaysia Cybercentre and a tourist destination by the Federal Government and as an International Park by the Selangor State Government.